Berries, nuts or other toppings as you choose. 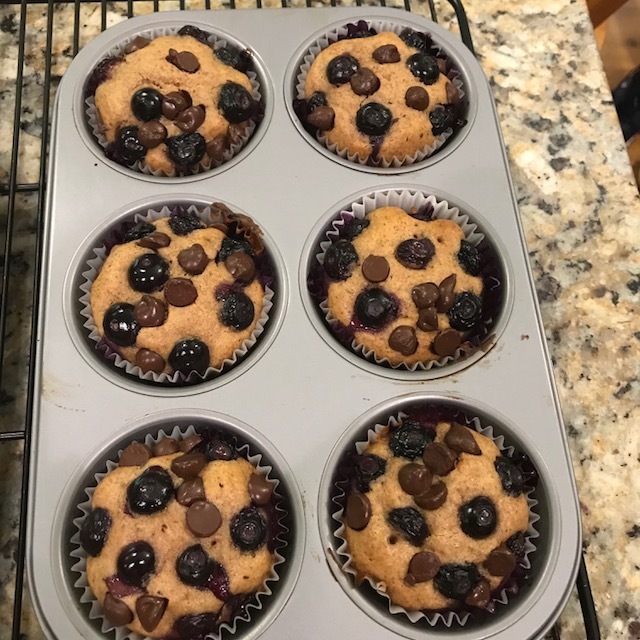 Delicious with blueberries. Whisk eggs in a bowl. Add applesauce, maple syrup or honey, vanilla extract and coconut oil and whisk well. Blend in almond meal and baking powder and mix until combined. Heat pan to low/medium and add pancake batter. Let cook for about 3-4 minutes on the first side, or until firm enough to flip. Be patient - wait until pancakes appear dry on the edges. Cook the second side for around 2-3 minutes or until fully cooked. Preheat oven to 350°F (180°C) . Line a baking sheet with parchment paper. Place the coconut shreds and sunflower seeds in a food processor and grind for 30 seconds. Add the cinnamon, salt, maple syrup, egg, and coconut oil and pulse until combined, about 2 minutes. Scoop the mixture onto the prepared baking sheet. Cover with a second piece of parchment paper and with a rolling pin, roll to ¼-inch thick. Remove and discard the top piece of parchment paper. With a wet knife, score the dough into 1-inch squares. (I typically skip rolling pin and just use a kitchen tool with a flat edge and scrape the mixture until very thin, and then use the same tool to score the cereal). Place in the oven and bake for 10 to 15 minutes, until firm to the touch. Remove from the oven and let sit on the pan for 15 minutes to allow it to crisp up. Store in an airtight jar. I love this - makes a great snack too! Prepare loaf pan. I use coconut oil. Lining with parchment paper is a good choice as well. Add additional ingredients, mixing thoroughly to combine. Bake for approximately 45 minutes until golden and cake tester pulls clean. Allow loaf to cool prior to slicing. Toppings of choice - delicious with berries, toasted nuts, pure maple syrup, honey. 1. In a medium mixing bowl, mix together the flours, sugar, baking powder, baking soda and salt. 2. In a liquid measuring cup, measure out the milk (and sour if not buttermilk). Beat in the egg and vanilla extract. Slowly add the coconut oil and whisk vigorously to blend. 3. All at once, add the wet ingredients to the dry ingredients and mix until just combined. The batter will have some small lumps. 4. Preheat your skillet over medium-low heat and scoop the batter onto the warmed skillet. Cook for 2 to 3 minutes until small bubbles form on the surface of the pancakes. It’s time to flip when the edges (about a ½ inch/a centimeter or so) look dry. Cook on the opposite side for 1 to 2 minutes, or until golden brown. 5. To keep warm, place on a plate or baking sheet in a preheated 200˚F (200˚C) oven. Repeat with the remaining batter and serve. Image shows two batches - the top using honey and the bottom with maple syrup. Can't decide which I like more! In a separate bowl, combine oil, honey or maple syrup and vanilla. Microwaving for 20-30 seconds will help to mix it. Pour your wet ingredients over the seed and nut mixture and mix well to coat. Spread on a baking sheet and bake for 15 minutes. Stir to break up and continue to bake for 10- 15 additional minutes, until lightly browned. Remove and let cool (it will develop its crunchiness as it cools). Flax has omega-3 essential fatty acids -"good" fats that have been shown to have heart-healthy effects. It is also a rich source of micronutrients, dietary fiber, manganese, and vitamin B1. Cinnamon is a wonderful anti-inflammatory. And both taste great! Serve with your choice of toppings: berries, banana, chopped toasted nuts, honey, maple syrup, toasted coconut, coconut sugar, milk or nut milk. I often make a double batch. It reheats well with a little added water or milk (of your choice) and you can even freeze it. Place water and salt in a large saucepan and bring to a boil. Slowly add steel cut oats and return to a boil, then reduce to a low simmer, cover and cook for 20 minutes, stirring occasionally. Add flax meal and cinnamon, stirring well and serve with your favorite toppings. Preheat oven to 325°F (170°C). Position two oven racks so that they divide the oven into even thirds. In a large mixing bowl, combine the dry ingredients. In a smaller bowl whisk together the wet ingredients. Pour the wet ingredients over the dry ingredients and stir until well-combined. Split the mixture between two sheet pans. Bake for 15 minutes, then carefully stir the mixture. Bake another 15-20 minutes, until it begins to brown. Remove to cooling racks. When cool, carefully break up the pieces and store in an air-tight container. Add dried fruit if you’d like.